With Memorial Day weekend approaching and the Food & Wine Classic in Aspen just weeks away, I wanted to devote a recipe post to Chef Stepahnie Izard of Chicago's Girl & the Goat. In the June issue of Food & Wine, Chef Stephanie translates some of her favorite restaurant dishes into easy to recreate at home BBQ and grilling recipes. Get up and run to get this issue! I was eager to try what she had to offer, as I LOVE using the grill and spending as much time cooking and dining al fresco as Chicago's wonderful weather permits. After my husband and I tested out the below recipe this weekend, I confident to endorse it as part of your Memorial Day weekend festivities. You will not be disappointed Your guests will be impressed. It's easy and delicious and sure to impress. I purchased flank-style beef short ribs pre-sliced at Marianos, and they worked out great. In a food processor, puree the vinegar with the olive oil, sambal, fish sauce and garlic. Transfer 1/2 cup of the kalbi marinade to a bowl. On a large baking sheet, brush the ribs with the remaining marinade and let stand for 30 minutes to 1 hour. Meanwhile, in the processor pulse the butter until smooth. With the food processor on, gradually add the reserved 1/2 cup kalbi marinade. Scrape the kalbi butter into a bowl. Light the grill. 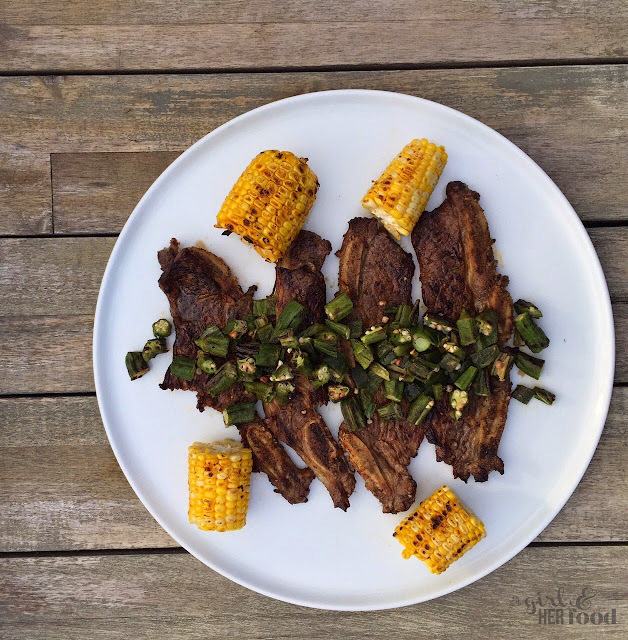 Brush the corn with kalbi butter and grill over moderately high heat, turning, and brushing with more butter, until lightly charred, 5 to 7 minutes. Transfer to a large platter. Season the ribs lightly with salt and grill over high heat, turning once, until nearly cooked through and lightly charred. 4 to 6 minutes. Transfer to the platter and serve with okra relish. Light a grill. Grill the poblano, turning until charred all over. Transfer to bowl, cover tightly with plastic wrap and let cool. Peel, stem, and seed the poblano pepper, then cut into 1/4 inch dice. Brush the okra with oil and season with salt and pepper. Grill over high heat, turning, until lightly charred all over, 3 to 5 minutes. Let cool, then cut off the stems and slice the okra crosswise into 1/4 inch rounds. Note: I had a difficult time slicing the okra as it would lose it's shape and get slimy during the process. I will ask Stephanie for some tips to prevent this next time! In a medium bowl, toss the okra with the poblano, fish sauce, shallot and vinegar. Season with salt and pepper and serve. Enjoy!